Born in the Soviet Union, Anissina enjoyed a very successful junior career with partner Ilya Averbukh, highlighted by two world junior titles (1990, 1992). The future was bright for the couple until Averbukh fell in love with fellow club member Irina Lobacheva. Averbukh decided to compete with Lobacheva and left Anissina without a partner. After a six-month hiatus from skating, Anissina sought out two skaters she had remembered from past competitions -- Canadian Victor Kraatz and Frenchman Gwendal Peizerat. Kraatz never responded, but Peizerat wrote back and said his long-time pairing with Marina Morel was nearing its end. Morel was suffering from injuries, and when she retired, Peizerat invited Anissina to France for a tryout. Anissina arrived in Peizerat's training town of Lyon, France, with a three-month tourist visa and a small suitcase. When the two got on the ice, their differences were clear. In addition to the language barrier, they had been trained in different countries and skated with different styles. Anissina exuded flamboyance, while Peizerat was more elegant. Even with the differences, Anissina remembers the experience fondly and says that it seemed like they had been skating together for years. After Anissina secured the proper documentation back home, she returned to Lyon. Anissina lived in Peizerat's home in an effort to help in the adjustment for the first two years. She now lives in an apartment and is joined by her mother in Lyon. The couple originally was forced to communicate in English, but now they speak only French. Anissina is a dual citizen of France and Russia but says she will probably return to Russia after her career is over. Anissina comes from very athletic parents. Her father, Vyacheslav, was a world champion hockey player for the Soviet Red Army. Her mother, Irina Cherniyeva, was a competitive figure skater. She and pairs partner Vassily Blagov were Soviet national champions and finished sixth at the 1972 Olympic Winter Games in Sapporo. Both parents remain involved in sports as coaches. Peizerat began skating at the age of 4 on the urging of his father, Eugene. Eugene is an official in the French Figure Skating Federation and a teacher of physical education. He urged young Gwendal to try out skiing, swimming, horseback riding and figure skating while growing up. A coach saw Peizerat on the ice and suggested to his parents that they should enroll him in lessons right away. In the juniors, Peizerat skated with Marina Morel for 12 years and won three junior national titles and two world junior medals. In 1993, Morel was struggling with injuries and the partnership ended. Around that time, Peizerat had received a letter from Anissina wondering if he was interested in changing partners. They had competed against each other throughout the junior circuit and Peizerat thought it was worth a try. In 1993, he invited Anissina to travel from Russia to France to see if the new partnership would work. When Anissina arrived in Peizerat's training town of Lyon, France, she had only a three-month tourist visa and a small suitcase. When the two got on the ice, their differences were clear. In addition to the language barrier, they had been trained in different countries and skated with different styles. Anissina exuded flamboyance, while Peizerat was more elegant. Despite the differences, Anissina fondly remembers the experience and says that it seemed like they had been skating together for years. After Anissina secured the proper documentation back home, she returned to Lyon. Peizerat offered Anissina a place to stay at his parents' home to help her adjust. She lived there for two years before settling in her own apartment. The couple originally was forced to communicate in English, but now they speak only French. Off the ice, Peizerat maintains a full life. He has earned multiple business management degrees and enjoys a variety of summer sports, including scuba diving, water skiing and rock climbing. In addition, Peizerat has always been serious about his academic studies and playing the piano. He constantly juggles his time for a good balance, but he says he is focused on the 2002 Games. The other pursuits can wait until after Salt Lake. Anissina/Peizerat teamed up in early 1993. Both skaters medaled with other partners at Junior World Championships. Anissina skated with Ilia Averbukh for Russia (today a sucessful ice dancer with partner and wife Lobacheva) and Peizerat with Marina Morel (who quit the skating scene after she split with him) for France. When Anissina lost her partner to Lobacheva, she wrote a letter to Peizerat, whom she rembered from junior competitions. Peizerat invited Anissina to his hometown Lyon (France) and they started skating together. Anissina's mother was an international pair skater in the former Soviet Union, and her father Viatcheslav Anissin is an ice hockey coach in Moscow. Peizerat's father is an official in the French Skating Federation. Their Free Dance tells the story of the last night of German composer Ludwig van Beethoven before his death. After winning two consecutive world silver medals, Anissina and Peizerat finally cleared the hump and won the gold medal at the 2000 World Championships. Their success continued early in the 2000-2001 season as they won all three ISU Grand Prix events that they entered as well as the French Championships. 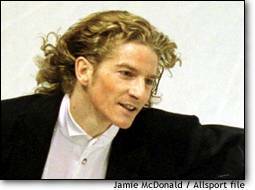 But at the 2001 World Championships in Vancouver, Canda, they once again fell to second place behind the Italian couple of Barbara Fusar Poli and Maurizio Margaglio and won their third silver medal. The partnership began in 1993 and has been very successful. In addition to the world title, the couple owns a European title and the 1998 Olympic bronze medal. Murille Boucher-Zazoui coaches the couple. Their choreographers are ice dancing legends and 1984 Olympic gold medalists Jayne Torvill and Christopher Dean of Great Britain.